Last week MLB.com wrapped up their annual top prospects series with the top ten farm systems in baseball. The Yankees placed sixth, their lowest ranking this spring. All the other scouting publications ranked the system second behind the Braves. Five rebuilding teams (Padres, Braves, White Sox, Rays, Phillies) top the MLB.com list. “Despite graduating a strong rookie class headlined by Aaron Judge, Jordan Montgomery and Chad Green and trading several quality prospects to acquire Giancarlo Stanton, Sonny Gray, David Robertson and others, the Yankees still might have the deepest system in the game,” says the write-up. Sounds good to me. 1. More on Torres’ power. Gleyber’s power has been a talking point in recent weeks. Keith Law said Torres projects to “probably just 10-15 homers a year” while Baseball America gave him 55 power on the 20-80 scouting scale, which is a tick above-average. MLB.com gives him 55 power as well, which used to equate to 20-ish home runs per season, but it might be a bit more now with the juiced ball. Law seems to be the low man on Gleyber’s power, which is fine. Sports are boring when everyone thinks the same thing. Given the juiced ball — assuming the ball stays juiced, of course — and the fact Yankee Stadium is a home run park in a division with three other hitter’s parks, I’ll take the over on 10-15 homers per season from Gleyber. Twenty dingers annually definitely seems doable to me. I didn’t realize Florial was such an extreme pull hitter last year. He had a 47.7% pull rate as well as a 54.0% ground ball rate — that ground ball rate is on the high side, though it’s not uncommon for a teenager in full season ball to hit the ball on the ground a ton — hence all those grounders rolled over to the right side of the infield. 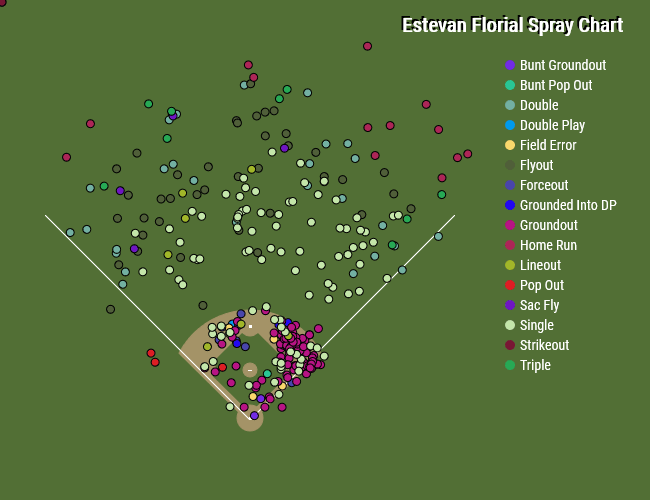 Florial did hit some balls out to left and center fields, but, for the most part, his damage came to the pull field. That’s not necessarily a bad thing or a permanent thing. This is a just turned 20-year-old kid who didn’t play a ton of baseball growing up. 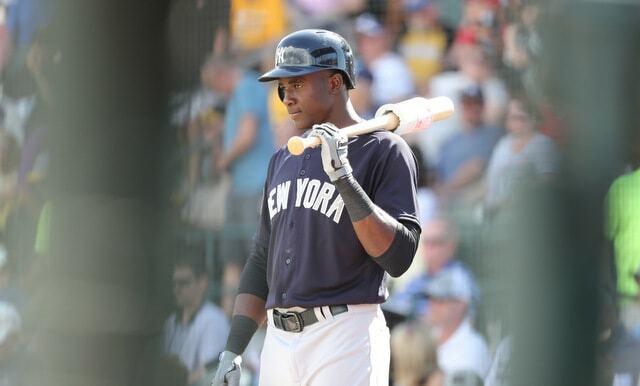 The Yankees hope Florial will do a better job making contact as he gains experience, and with any luck, he’s also learn to spray the ball to all fields as well. Nothing wrong with being a pull left-handed hitter in Yankee Stadium though.
? I’m of the belief left-on-left matchup relievers are a dying breed. The good ones like Jerry Blevins will always stick around, and I suppose if MLB adds a 26th roster spot at some point, lefty specialists could remain a thing. Generally speaking though, starters are throwing fewer and fewer innings with each passing season, and using a roster spot on a reliever who only gets one or two outs at a time won’t be feasible much longer. Lane, however, has a chance to be a “multi-inning southpaw reliever who’s effective against both left-handers and right-handers,” according to MLB.com write-up. That is mighty interesting. The Yankees like Lane enough to bring him to camp as a non-roster player and scouts dubbed him the best relief prospect in his league last year, so people are taking notice. That means it’s time I do so as well. 4. What do the Yankees have in Smith? OF Canaan Smith, who the Yankees selected in the fourth round last season, hit .289/.430/.422 (151 wRC+) with more walks (46) than strikeouts (44) in 57 rookie ball games during his pro debut. His 19.4% walk rate was 13th highest among the 2,132 hitters with at least 200 plate appearances in the minors last season. MLB.com ranks Smith as the 28th best prospect in the system and the write-up says he “made enough of an impression that other clubs began asking for him in trade talks.” Interesting! Over the years I remember hearing reports that Andujar and Florial were asked about in trade talks very early in their careers, and both grew into excellent prospects. Trade interest is a great way to gauge a prospect’s value. Teams don’t ask about nobodies. If there is already interest in Smith, a left-handed hitting outfielder with pop and military style plate discipline, the Yankees just might have something here.